Today it is the first of December, the month that seems to outshine all previous months through lights, cameras, action. There is so much to be done. We have Christmas and its hopes; New Year’s Eve, the promise of a clean slate. Still, it is a lot to juggle. We shop a lot, looking for things. Things for others, maybe for ourselves. Sometimes, a lot goes into being merry and bright. But November was a heavy month. Some months are harder to let go. Maybe we need to think about them a few more days, hold off on the next big thing. Although it is December, ready or not. I know that, but still. The first weekend in November I take my son Christopher and his friend Matthew to the Wings Over Houston Air Show. I don’t really want to go–my father, who retired as a full colonel from the Air Force Reserves, has taken him in the past. But he is out of town, and Christopher is obsessed. Space City Parent Magazine tells me that if I donate a gift card to a needy teen I can get tickets. Who can say no to that? We are going. It is a good thing, as it turns out it is the most amazing thing I have seen in years, and I am no recluse. My resistance is just one of those times when I have no idea what I am talking about. Luckily, my guardian angel intervenes, sets me straight, gets me to where I need to go, which is the Air Show, at Ellington Air Force base, in Webster, minutes from my home. They have it every year–don’t ask me where I have been. I have been prejudging things, dismissing miracles, missing out. When we arrive, the first thing we see is a replica of the Vietnam War Memorial in Washington D.C. It is the memorial that lists the names of the fallen in the order of their deaths. There are so many names, I can’t even wrap my mind around it. We stay there awhile, donate money to its upkeep. It seems so paltry, but it’s so sad to see those names you want to do something–anything. Most of those men and women listed were just kids. But then we get our tickets scanned, see so many in military uniforms at the air show. Some are in uniform, some are in fatigues. Some of them are in wheelchairs, back from Iraq, Afghanistan. Some have lost limbs, maybe part of their minds, maybe more–more than we will ever know. So many of them look so young to me. Just kids. We see replicas of the planes that dropped the bombs on Pearl Harbor–the planes were used by Hollywood in the movie “Tora! Tora! Tora!” Later, those planes will ascend into the sky–reenact that fateful day. They have something to remind you of almost every war–the pyrotechnics are amazing. They are real–just done at a different time. Like now. You can’t really picture any of this from pictures–you have to see it in action. My eyes go up to the sunny Houston sky over and over–it does not matter if it is the woman from La Porte, Texas who has won more military championships flying her plane than anyone, or the huge plane known as “Fat Albert” that soars through the air as graceful as the smallest fighter jets–you are amazed, and you cannot look away. There is even a reenactment of a Coast Guard rescue mission, and you cannot help but think: “Please do not let me ever be the person who takes my boat out at night in a storm thus requiring the assistance of the Coast Guard.” The narrator reminds us that even though it is in the seventies, sunny with a mild breeze, that the Coast Guard hardly ever gets to work in these conditions. No kidding. The orange helicopter rescues the victim, who hangs by a cord. The helicopter is like an angel descending, saving someone from utter ruin, certain oblivion. Near the end, the highlight begins: The U.S. Navy’s famous Blue Angels. I have never seen them before. Christopher tells me they didn’t perform last year because of the sequestration. But they have come back, just for us. There are six planes–four that are a team, and two super flyers. Most of the time, all six are in synchronicity. Sometimes, they are only 18 inches apart, in perfect formation. They form perfect diamonds, fleur de lis formations, death defying configurations in which they drive toward each other at hundreds of miles per hour. You are sure they will collide, conflict, crash. But they don’t. They have a plan, and they have practiced thousands of hours. But it looks effortless, feels like a miracle. They really are angels, flying above us, making us look up. Sometimes, they fly and part ways, moving fast and furious into the atmosphere. I am sure they have left for a different galaxy, they have flown so fast, and so far away. But they come back, every time. I don’t really have the words to do the Blue Angels justice, their performance is so perfect, you can hardly believe you are watching it in real time. You think it might be a movie with special effects. But it is not. I read the biographies of all the Blue Angels in the program we bought we we arrived. Guess what? They are as accomplished here on earth as they are in the skies. They do good works, have advanced degrees, take a G-force that boggles the mind so we can breathe, live free, shop for Christmas, sleep safely at night. They take my breath away. The boys want their autographs, and who can blame them? The pilots have descended from their planes, in perfect military formation. They patiently sign every program for every person who wants them. They are calm, collected, friendly. They are some of the best Americans imaginable, but you don’t have to imagine them, they are here, now, signing autographs. The boys thank them for their service to their country. One of them says, “I am happy to serve. Thanks for coming out.” Their humility is overwhelming. They are so excellent, but act like their flights through the air are like walks in the park. I realize these six young men could have done anything they wanted to, but they chose to do the work required to be part of a team, part of the Blue Angels, serving their country. They decided to be part of something bigger than themselves, and it is not lost on the boys how lucky we are to have seen angels in the air. November fifth, my friend Sarah Gish and I go to Jones Hall and hear Joshua Bell. He is a famous violinist. He might be one of the best violinists I have ever seen. He is mesmerizing, does two encores. Everyone is up on their feet, standing for the ovations, no one wants him to leave. He is also an accomplished video player, a nationally recognized tennis player. Still plays. He plays his music on a 1713 Stradivarius that is worth so much money I cannot even type the numbers out. He plays all over the world, we cannot get enough of him. In December, he will be in colder climates: St. Petersburg, Moscow. I tell Sarah that I feel lucky that he even came to Houston. He is here for just one night. When he plays, you feel joy, no matter what the piece. The notes soar, so does your spirit. You think of this earth, its troubles, its difficulties, and for a moment, you think nothing could cure the world better than the music you are hearing, from Joshua Bell’s amazing violin, which carries not just the score, but every hour he has practiced, every emotion that has washed over him as he plays each exquisite note. There is talent, but there is also experience, and there is nothing like the presence of both. In 2007, the journalist Gene Weingarten wrote a Pulitzer-Prize winning piece on Joshua Bell playing incognito in Washington D.C. He would play in public, but most of the time no one knew who he was. I wonder what it felt like to hear that music, wonder if people could figure out where the angel came from, the one standing there, sounding out note after stirring note. I wonder what made the difference between the ones who would linger and listen, and those who walked on by. When the concert is over, Sarah and I sit outside and talk, catch up. I love her energy. She is an artist, always creating. We stop talking when we see the glass doors open. We thought everyone had gone. Joshua Bell, his pianist, and his page turner all walk out together, into the Houston night, so casually that Sarah and I start to laugh. They walk by without pretense, without affectation. Joshua Bell is carrying his own violin, so calmly. Like a walk in the park. November has its heartaches. Ferguson makes us stop, realize we have losses that seem impossible to bear, wounds that will take a long time to heal. I don’t know what happened that night between that police officer and that young man, and I am so sorry that someone died. The comments in the media are as polarized as one can imagine. I don’t know what happened in that grand jury room. There were demonstrations all over–even in Houston. I try to put myself in the shoes of the officer, the deceased, both of their families. But I was not there. Most of us will never really know what happened. But I think of the jobs lost in Ferguson because of the fires, the demonstrations, the looting. I think of the businesses that will never come back. Sometimes, we need an angel to intervene, show us the way, tell us what to do, because fear or sadness or anger has overcome us. But there is this: in a photograph that might very well have gone viral, there is a white uniformed police officer who is embracing a young black man who is crying, there for the demonstration. The officer is holding this person, who looks so young to me, like a boy, in a way that a father might comfort his grieving son. Or how a friend might hold another friend. I look at that photo for a long time. It seems like there are two angels here: this officer and this young man, who have embraced each other, had a moment of empathy, of peace. It makes you feel profound emotions, as when improbable planes take off, or music takes over all the attention you have. But I am incorrect: there are three angels. There is the also person who took the photograph. November was long–yet it is gone. There were injuries, miracles, heartbreaks, but, also, love. Also, joy. I turned another year older in November, the same day as Grace Kelley’s birthday. I went to Monte Carlo once, saw the road named after her, saw the road where she met her tragic death. Often, I think of the people who knew her well and the things they said about her. She wasn’t just beautiful and talented. She was also kind and generous. She reached the heights of so many things: beauty, acting, parenting, being a princess, supporting so many causes. That face never betrayed the heartbreaks, the disappointments. But that does not mean they were not there. I think of the perfection of her name: Grace. Today, the first of December, it has rained most of the morning, washing away the last of November. We have had a few days over Thanksgiving to think things over. Maybe December will have something in store that only angels can deliver. It’s not lost on me that more people stood in line this year for shopping on Thanksgiving and Black Friday than for the mid-term elections, and that something seems out of kilter when we have such low voter turnout and yet demonstrate in a way that causes fear when something sparks a sense of injustice. I cannot explain this–but maybe I will have to think about it anyway, as it is a sign of something–a November lesson. When I went to the Air Show, I realized that the power in the air was a model of cooperation because the stakes are so high in protecting us from violence and in protecting our freedoms. I realized those pilots have to practice hour after hour after hour to protect us because we cannot seem to figure out how to get along here on earth. They have to be ready to fight because we won’t stop fighting. We need to call on all the angels we can, because we take for granted the freedoms that the military protects, and then sometimes don’t vote even though if it were not for them, we might not have that right. These things are connected. We have forgotten, sometimes, how to recognize the miracle of the music in front of us, and we walk on by, away from the genius who has been placed right in front of our paths. We have forgotten the wordless message of creativity, even when it is hand-delivered, and forget to apply it to other categories of life. These things are connected. We have forgotten, unless someone shows us, in a photo or a moment, that we have more in common as Americans than our differences might suggest. Thanksgiving is one of those holidays that comes around every year, every November, to remind us how these things are connected. We need an angel, right now, to make sure we remember how to connect. We are already good at division. 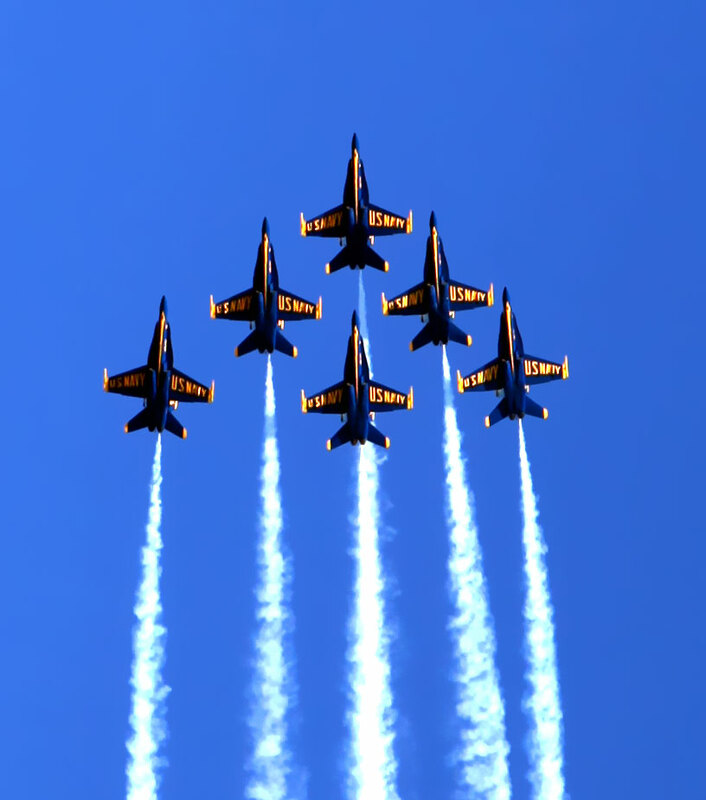 When the Blue Angels fly, my favorite formation is the Blue Angel Diamond: all six in synchronicity, only inches apart from each other, flying fast, so fast you cannot believe it, upward and onward, perfectly aligned, up to the heavens, forcing you to look up, into the sun, amazed at the miracle of it, the sublimity of it. It makes you feel alive, happy that such dangerous angels exist, happy that there is unison as they sail through the skies, making you want to do something that will make someone look up, take their breath away, have hope. Thanks for continuing to write with your own beauty and grace Doni! Thank you so much, Elizabeth! Hope to see you in 2015–that would be great!